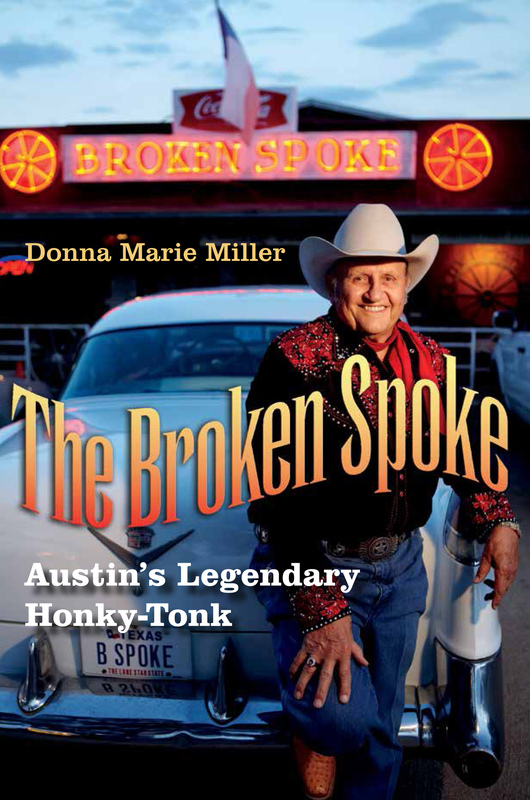 When James White opened the Broken Spoke in 1964, it represented the last stop for civilization 1 mile south of what then served as Austin city limits. Fifty years later the dance hall, which Entertainment Weekly voted “The best country dance hall in the nation,” still stands on South Lamar Boulevard and endures as part of a legacy of a bygone time for the city that has boomed around it. Broken Spoke proprietor James White sat in on stage with Weldon Henson on day one of the Broken Spoke’s 50th anniversary party Nov. 4, 2014. James leased land from Jay Lynn Johnson Jr., the owner of a construction business, who also helped James work on the original 32-foot wide by 60-foot long building. Meanwhile, he thought about what to call his new venture. “I started thinking about the things that tie into westerns and country. My mind was always on a wagon wheel,” he says. “Then, like a light bulb that went off in my head, I remembered a Jimmy Stewart movie called Broken Arrow. I thought, I’ll just name it the Broken Spoke.” He and his wife, Annetta, officially opened the Broken Spoke a few months later on Nov. 10, 1964. But folks didn’t just come for the drinks; the Spoke became known as a place to hear great music and dance the night away. White paid his first band, D.G. Burrow and the Western Melodies, $32 to play. Dancers used to push back tables to shuffle, Texas Two Step, polka and Cotton-Eyed Joe. “Girls in their best dresses danced with the guys right out the front door into the dirt parking lot and then danced right back in,” says White. In 1965, the Whites added an extension, a 90-foot dance hall with a 65-foot stage. Legendary fiddler Bob Wills performed there in 1966, 1967 and 1968 — each time filling the Spoke to capacity with 661 people. Wills wasn’t the only legend to play the Spoke. Over the years, Ernest Tubb, Ray Price, Buck Owens, Kitty Wells, Roy Acuff, Kris Kristofferson, Dolly Parton, George Strait, Willie Nelson and Jerry Jeff Walker have all graced its stage. Hardship has not been a stranger to the Whites. Their roof leaked for 25 years until it was replaced in 1989. “Every time we had a good rain, we’d have to put out various containers to catch the water where it leaked,” says James. He began having heart trouble in 2000; Annetta survived breast cancer in 2005. Then on Oct. 2, 2005 a driver for the Geezinslaws Brothers band tour bus drove it through the back wall of the Broken Spoke; it took four days to remove it. Johnson, their landlord, died in 2001 and his children sold the land to Riverside Resources in 2010. Riverside in turn sold it in 2012 to Transwestern developers who began a two-year construction project surrounding the Broken Spoke that hurt its business. The Whites have endured, for the most part unscathed. These days, folks still head to the Spoke for good music, good food and plenty of dancing. 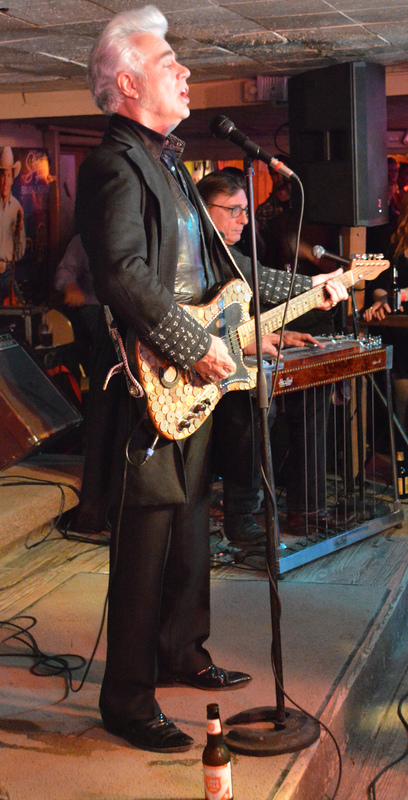 Ray Benson and Asleep at the Wheel, Dale Watson, Gary P. Nunn, Bruce Robison, Marsha Ball and Alvin Crow are just a few of the musicians who still perform regularly at the honky-tonk. White, who just turned 75, still wears his standard uniform of Wrangler jeans, Swarovski crystal–studded Western shirts, a Gene Autry-era neckerchief, a Resistol Platinum silver belly hat and Lucchese ostrich skin boots. He greets visitors on weekends, just as he has for the past 50 years. The Whites remain in charge of all of the Broken Spoke operations, but their two daughters, Terri and Ginny, and son-in-law, Mike Peacock, help out. Terri teaches both private and group dance lessons five nights a week, while Ginny acts as the manager and her husband, Mike, tends bar and sometimes handles cover charges. The Spoke’s iconic standing in the city has grown even more in the past few years, as two four-story, multi-use properties known as the 704 have been built around it. Now, when driving down South Lamar Boulevard, residents can literally see the juxtaposition of “new Austin” and “old Austin,” in the shadow that the buildings cast over the Spoke. 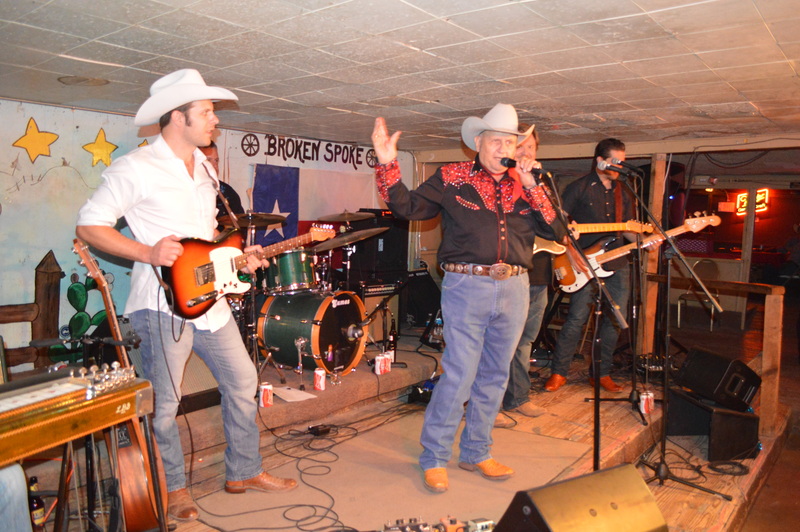 The Broken Spoke celebrated its 50th anniversary with a series of special performances at the dance hall Nov. 4-8, 2014. Please see my photo slideshow below. Thank you! Hofeldt together with guitarist and lead singer Tony Villanueva, formed the band that has since produced 10 albums on two different major record labels, as well as four independent labels and beat the all-time attendance records at the Broken Spoke over its 50-year history. Villanueva left in 2003 to pursue other interests and since then, Hofeldt has fronted the band. The Derailers began working at the Broken Spoke in 1995, after leaving a substantial gig where they played every Wednesday at The Continental Club in Austin. “We had these ‘Train Wreck Wednesdays’ we called them when we did them at the Continental Club and we were packing that room out to such an extent that we needed to come over here to The Spoke. We had a good thing goin’ so we asked James (White) if we could bring our Wednesdays over here,” Hofeldt said. “Watson’s idea stems from the concept that if Americana music comes from Woody Guthrie, then Ameripolitian comes from Jimmy Rogers. Ameripolitan music borrows musical concepts from Americana, roots, country, hillbilly, rockabilly and honky tonk genres,” he said. Hofeldt and Villanueva met in Portland, OR, a place some regard as Austin’s “sister city.” The Northwestern coastal town remains cold and rainy most of the year and lacks what Hofeldt deems to be the single most important ingredient to launching his band’s success in 1994. “One of the many interesting and unique aspects of Texas is the dance hall scene. The Broken Spoke being one of the main and greatest ones in the state of Texas, to me, it’s the greatest honky tonk in the known universe. That’s just my opinion, but I think a lot of people share it,” he said. Moving to Austin from Portland as a 26-year-old musician felt a lot like “going to trade school,” he said. Hofeldt said that his friend, Villanueva, first discovered Austin on his way traveling to Nashville; when he stopped here he just never left. “He said to me, ‘You gotta come down and visit.’ So I came down to visit in ’91 or ’92 and I just was blown away. There were all these great bands, this great music scene and Tony made sure to take me here to the Broken Spoke. I think that’s part of the tradition — whenever anyone comes to town, people bring them to the Broken Spoke,” he said. Villanueva and Hofeldt formed a special bond as former bandleaders of their own separate bands, but they also played together in another band as sidemen before moving from Portland to Austin. “The singer from that band went ‘AWOL’ one time, right in the middle of recording. We were making a record, so Tony said ‘Hey, I could try singin’ a few of these tunes.’ The bandleader told him to give it a shot. As soon as Tony started singin’ he just brought the band up to a level where it had never been before,” Hofeldt said. Hofeldt said both he and Villanueva decided to take their music in a different direction. Shortly after, Villanueva moved to Austin. Hofeldt followed Villanueva and afterwards the two almost immediately put together a band here. “It’s funny. We put together the band and we had a gig. There were four of us. We booked a gig before we even had a name. We were at a typical outdoor Austin barbecue and started throwin’ around ideas. Both Tony and I had grandfathers who worked for the railroad,” he said. Villanueva had been writing original music and the two of them began to write together for this new band. “Tony presented me with a handful of songs at that point that I thought were great. He had played some of them for me before he moved here to Austin. I actually did a couple of his songs in my solo act that I was doing back in Portland,” he said. Hofeldt quit his job laying carpet. Villanueva quit his job working as a custodian at Motorola. They began a small painting company together called, ‘The Detailers’, to go along with the band name and did this between gigs while waiting for the band to take off. Hofeldt some years later saw his former boss in the crowd at the Broken Spoke when the Derailers performed. “He’d come out and seen us before, and he reminded me that he remembered me sayin’ ‘Carl, I didn’t move to Austin to lay carpet. I’ve got to quit, man.’ And eventually, we quit our jobs to go at music full time.” Hofeldt said. The band took this town by storm. “We were fortunate. We had a magical partnership and the timing was perfect. Country music had gotten bigger than it ever was before. That was the Garth Brooks’ heyday. Everybody, like Alan Jackson sang, had ‘Gone Country.’ Country was just so big it created room for Alternative Country — the same way it was with rock n roll — and Texas was big too.” he said. Hofeldt said that he realized at the time that his and Villanueva’s fortunes depended upon securing a future playing at the Broken Spoke. “He (owner James White) already knew of us; we had come in and had talked to him before and had asked him for gigs. I think (White’s youngest daughter,) Ginny White had been out to our ‘Train Wreck Wednesdays’ at the Continental Club and had told her daddy about that. She helped us to get in,” he said. He said the three club owners visited one another’s clubs often in those days. “It’s unusual. You don’t see a lot of club owner go to other clubs. When we moved our ‘Train Wreck Wednesdays’ over to here, Steve Wertheimer was in the audience every Wednesday, even though we had moved from his club,” Hofeldt said. Also fortuitously, another one of Wertheimer’s friends included John Kunz, owner of Waterloo Records, who became a partner in Watermelon Records, the Derailers’ first label, after their local release, Live Tracks, on the fledgling Freedom label. 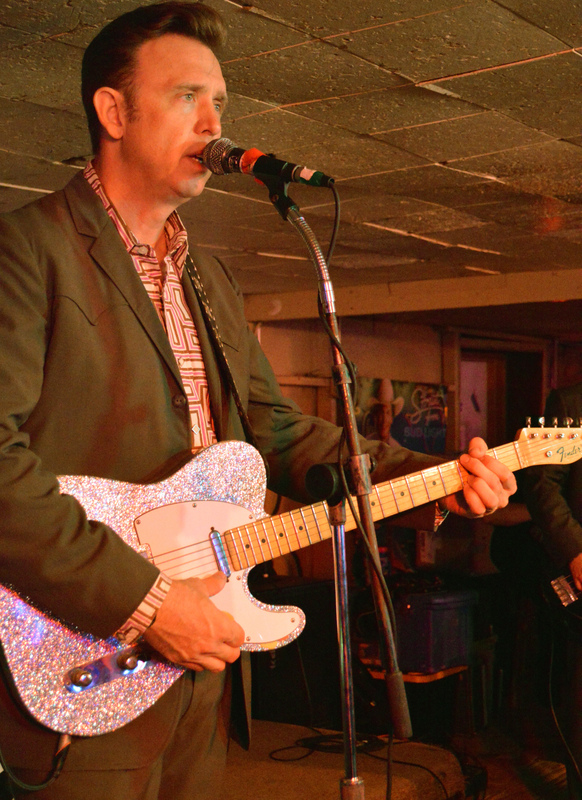 The Derailers’ sweet Austin beginnings had launched a worldwide musical career. “It’s good to count your blessings and to look back and be thankful for the good fortunes that presented themselves. I have to say though, that we really, really worked hard in addition,” he said. In 1998 alone, the Derailers worked 320 gigs, often zigzagging across the United States and the globe. “That was sometimes two-a-day shows – sometimes during the day at a record store or radio station, and later at a club. We did a lot of work that year. I would also say that in the surrounding years of 1997 and 1999 we worked around 275 days and in 1995 and 2000 we worked around 250. We really, really worked hard,” he said. He said he remembers otherwise passing through Austin, just another stop on their tours throughout the United States and all across the world. “At least we got to be in our own homes one night though, two maybe, and always back here at the Broken Spoke,” Hofeldt said. Burnout followed. The Derailers had signed with two major labels, including Sire Records, a division of Warner Brothers Records and then Sony Records and Lucky Dog to produce their albums. “Our first major was the label that produced the Pretenders, the Talking Heads, the Ramones, and Madonna, — bands not exactly in our genre, but a great label with a great label head who was just a real fan of music, (cofounder and chairman of Sire Records,) Seymour Stein, who still runs that label, if I’m not mistaken,” Hofeldt said. The consequences proved detrimental to their personal lives. He remembers feeling “a little bit of tension in the studio” as early as 1998 while working on the Derailers’ album, Full Western Dress, which included a cameo performance by Buck Owens himself. The band’s members felt overworked and torn between their musical careers and their personal lives, Hofeldt said. Not long after the release of the album, Villanueva fell ill.
“Tony got real sick. He was in ICU with pneumonia. We had to do a week or two of gigs without him. It was scary. He didn’t look good and I didn’t know what was going to happen,” Hofeldt said. Hofeldt said meanwhile, he filed for divorce from his own marriage about that same time. “I was married at the time and trying to get out of that marriage. I was married to a Texas woman. I had never had anyone pull a gun on me before, but my wife pulled a gun on me when I wouldn’t shut off the TV,” he said. Hofeldt eventually divorced and found his true love, Tiffany Hofeldt, a professional photographer in Austin. Meanwhile, Hofeldt decided to step up his musical game and to lead the band that included drummer and percussionist Scott Matthews, Ed Adkins on bass and vocals, and pedal steel and Dobro player Chris Schlozhauer as well as “Sweet” Basil McJagger, who played piano and organs. Matthews and McJagger remain as original band members of the Derailers to this day. “I had three or four other musicians lookin’ at me like ‘What are we goin’ to do?’ So I had to do something. So I finally decided to do something. There was no way I was going to replace Tony; he was irreplaceable in my heart and physically in every way. I couldn’t get anyone who could sing with me that way,” Hofeldt said. He said that the band had to meet their obligations to perform at places already on the schedule. Once the Derailers met those dates, they continued to tour and began planning a new album. Two years passed. In 2005 the Derailers recorded their hit Soldiers of Love album and released it to stores in 2006. “It was little bit of a lull in recording, but not much of a lull in live performing. We kept on going and it was probably as important as anything at that point to reintroduce the newly modified Derailers back to everybody,” he said. Hofeldt admitted that the Derailers have been lucky over the years. “We’ve been lucky, yes we have and I think our home base, the Broken Spoke was such an essential part of that. James kept us on here and there was probably a lull in attendance for a year or so and then it popped back up,” he said. From 2001 through 2003, the Derailers broke all previous records for drawing capacity crowds at the Broken Spoke, he said. He said that in 2006 the Derailers found their sweet spot again with their fans. “We did what we did by sticking to our roots, from where we came from, which was the Texas dance hall scene, simply the Broken Spoke. We had learned how to entertain from this room and that required playing a variety of music,” he said. It helped that their fans associated the Derailers’ music to a band, instead of a single person or front man. White’s support also motivated Hofeldt, he said. “Everybody knows the name of The Beatles, but not everybody knows the names of the guys in Steppenwolf, for example. So, in that regard I was fortunate. ‘Where’s that other guy?’ was sort of the extent of what people asked,” he said. During their banner year of 2006, the Derailers began to represent the Broken Spoke. The band also began to draw a newer crowd that never questioned its musical origins. It drew the attention one patron, legendary songwriter James E. “Buzz” Cason, who had already written songs for The Beatles, Pearl Jam and U2. Cason co-authored his greatest hit, “Everlasting Love,” with Mac Gayden before 1967 when Robert Knight recorded the song. “We just had our heads down and were workin’ to make this thing continue. Soldiers of Love was our first record without Tony and we had a song on it that album called ‘Cold Beer, Hot Women, and Cool Country Music’ which we wrote about the Broken Spoke,” Hofeldt said. Cason had come out to watch the Derailers at the Broken Spoke and befriended Hofeldt. “When you’re first impressed by the Broken Spoke it hits you pretty strong. I think his (Cason’s) impressions were still fresh when he said ‘Man, comin’ out to see you guys – cold beer, hot women, and cool country music sort of sums it up.’ I went to his place in Nashville and we wrote it,” he said. The old Derailers fans remained loyal as well. Waterloo Ice House, used their song as a soundtrack for a radio commercial. “I had to re-sing that part ‘Cold beer, good food at the Waterloo Ice House.’ It all helped,” he said. Then after Buck Owens’ death March 26, 2006, the Derailers began work on a tribute album to him, entitled: Under the Influence of Buck, that included 13 of the country music star’s classic hits. They released the album in 2007. Often in the middle of their show at the Broken Spoke, White joins the Derailers on stage to sing a medley of Owens’ songs. The Derailers traditionally play lots of other legendary songs once performed by their original singing stars at the Broken Spoke, including Charlie Walker’s hit, “Pick Me Up on Your Way Down.” The Derailers perform Walker’s dance hall classic, written by the late great Harlan Howard, every Saturday night that they perform at the Broken Spoke. Hofeldt said that he feels a fraternity of friendship among the photos of all the stars who have performed at the Broken Spoke in the last five decades. He said he shares that feeling with other regularly performing musicians who play at the Broken Spoke including Alvin Crow, Cornell Hurd, and Dale Watson. “It’s interesting and really cool to be part of the legendary aspect of this dance hall,” he said. At the end of every Saturday night when they perform there, the Derailers sing the old Hank Williams’ song, “I Saw the Light.” White and his son-in-law, Mike Peacock, often join them on stage to sing along. “I’ll say: ‘It’s technically Sunday morning now, everyone. It’s after midnight; it’s technically Sunday so we’ll send you out with a little gospel number,’” Hofeldt said. Hofeldt equates the Broken Spoke to a place where fans for 50 years have gone to worship live country music — it has its own “magical and legendary” spirit, captured in photographs within its hallowed dance hall walls. “As I say, it’s the greatest honky tonk in the known universe. It is and everybody knows it. It’s in Texas and ‘Texas music is better,’ as Cornell Hurd says,” Hofeldt said. White’s often demonstrates an evangelical-like persona during nights at the Broken Spoke, as he welcomes visitors from near and as far away as Japan, Norway, and the Netherlands, he said. “There’s a timeless aspect to walkin’ into the Broken Spoke on any given night. I’d say it could have been or feels like 1964, when James first opened the Spoke. James and Annetta built it and opened it and he’s still standin’ there greeting everyone who comes to the door,” he said. Both James and Annetta White suffered through health problems in recent years — he has had his share of heart troubles and she battled and survived cancer. Still, the two remain tougher and stronger than ever. They have a perfect relationship that works well, Hofeldt said. “I see him as vital as ever, more so in some ways and that’s really awesome. We’re like a family all of us,” Hofeldt said. Hofeldt said just like a family, the Whites each have roles to play. Acting as a disciplinarian, Annetta White, has been “mad as a hornet” at times with him. Most recently Annetta White let him know how she felt when the Derailers performed an extended version of the song, “Susie Q,” originally recorded in 1956 by rockabilly singer, Dale Hawkins. Creedence Clearwater Revival popularized the song also covered by the Rolling Stones in 1964. “She did not mince words with me about how she did not want to hear that song in here anymore,” he said. He said he always imagined himself as a leader of a country band. His life is great. “I’m living my dream. I feel very fortunate. Sometimes, I just focus on that. Like Carl Jung says, ‘We are always happiest when we are dreaming.’ We are dreaming about what we want to achieve or what our lives will be like in the future, that’s when we’re happiest. But those things happen to you and you pass them by and push them away because you’re always looking ahead,” Hofeldt said. Other original members of the Derailers include Matthews and McJagger, as well as Vic Gerard, who has returned to the band after a hiatus from raising a family. He originally performed as a Derailer in the 1990s. Occasionally, Mike Daily, will also sit in to play steel when he’s not performing with the Ace in the Hole band, now that George Strait has stopped touring.